Orange County commemorated National Arbor Day this morning by planting a native, Flatwoods Plum tree in the Florida-Friendly Landscaping™ Demonstration Garden located on the grounds of Orange County Government Administration Center. The ceremony included a proclamation declaring today, Friday, April 25 as Arbor Day in Orange County. 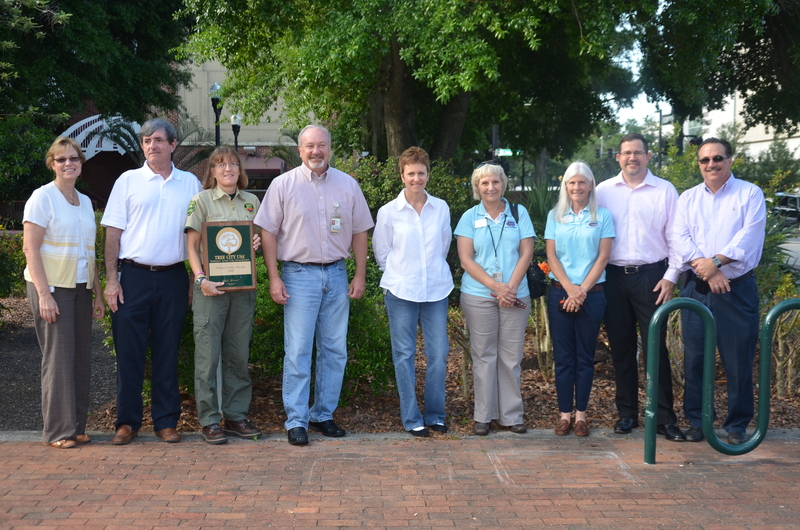 Senior Forester Dana Sussmann, Florida Forest Service, presented Orange County the 2013 “Tree City USA” Community Certification Award. Orange County has earned the “Tree City USA” designation every year since 2006. To qualify, a community must have a tree protection ordinance, a tree board or office, and dedicated funds for the care and planting of trees. Trees contribute to sustainability in Orange County, “Our Home for Life,” to help make it a healthy, prosperous, and connected community. Trees add biodiversity and beautify our neighborhoods, increase property values, help enhance economic vitality and provide habitat for wildlife. Furthermore, trees remove carbon dioxide from the atmosphere, cleaning the air and giving us back oxygen to breathe. Mayor Teresa Jacobs encourages Orange County residents to plant a tree to benefit their community and future generations.